And I used it on the cover of these notebooks. I found some fun single section sewings in Keith Smith's book "1, 2, & 3 Section Bindings" and these notebooks are made using a modified version of a sewing he describes. 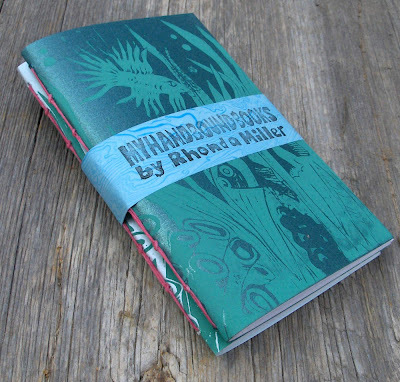 I've also used some of my other linocuts for making notebook covers too. I used another sewing from Smith's book for the bright orange & pink notebooks and the brown & black ones. The little pink notebooks have a simple 3-hole pamphlet binding. Wow!! Those are so beautiful...what a wonderful job you did with them! Very beautiful. Love the cut and the wrapper! haha, it is true bookgirl! i was so worried about that printmaking course. i didn't think i would take to it...! Rhonda, I just love the underwater lino cut - my favourite theme. Looks stunning on your books. You are so very multi-talented. Rhonda, what are you using to press your linocuts onto paper - do you have access to the print-making shop at NSCAD? How do you get even pressure? I'm thinking of trying a pie crust rolling pin, but it's packed in god only knows which one of my many boxes. Obstacles to art! Anne, I lay the paper on top of the linoleum and rub it with the back of the wooden spoon. I don't always get even pressure... i just try to cover the whole surface. And then i can pull back the paper a little bit and have a look - if i see areas that haven't transferred completely, then i continue the rubbing. as long as the paper doesn't shift position, then you can peek at it and keep going until you are happy with the results. i've never tried a rolling pin! Your linocuts are awesome. The books are beautiful too!! 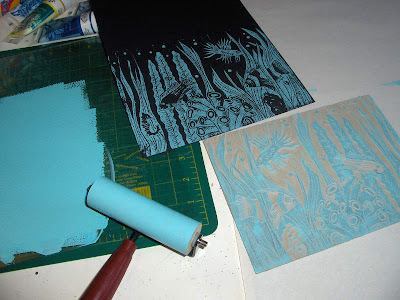 I love the underwater linocut on black - what inks and paper did you use? I've used black stonhenge paper before but sometimes struggle to get a strong enough image on it. thanks tammy. that was done using Speedball inks on plain black cardstock, keepin' it simple!